Qiagen’s next-generation sequencing (NGS) technology will be used by Bristol-Myers Squibb (BMS) to develop gene expression profiles as predictive or prognostic tools for several of the pharma giant’s immuno-oncology (I-O) therapies. The companies said they intend initially to develop gene expression profiles for “several” BMS I-O molecules, without specifying which ones, then develop diagnostics using the jointly developed profiles, and expand the use of NGS technology with other BMS I-O therapies. Qiagen and BMS have worked as partners since 2009, most notably teaming to win FDA approval for the Therascreen KRAS RGQ PCR Kit companion/complementary diagnostic assay in 2012 for Erbitux (cetuximab), which BMS co-marketed with Eli Lilly in the U.S. until 2015. The companies’ latest collaboration—whose value was not disclosed—is designed to combine BMS’ portfolio of I-O therapies with Qiagen’s portfolio of NGS technologies, as well as its expertise in developing and commercializing companion and complementary diagnostics. 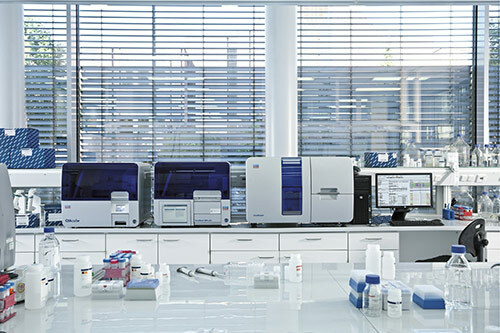 Qiagen’s NGS portfolio includes the GeneReader NGS System, which the company says is increasingly designed for pharmaceutical companies seeking to apply next-gen sequencing. GeneReader includes integrated bioinformatics for analysis and interpretation of NGS data, and a family of gene panels under the GeneRead QIAact brand, designed to enable laboratories to identify gene variations linked to cancers and to deliver actionable molecular insights—what Qiagen calls its “Sample to Insight” approach to NGS workflow. Qiagen says GeneReader’s capabilities include high-sensitivity detection in liquid biopsy samples, compatibility with the company’s QIAsymphony automation platform for high-throughput sample processing, and software integration with leading Laboratory Information Management Systems (LIMS). The current version of the GeneReader NGS System is available in the U.S. for research use only. Qiagen re-launched GeneReader earlier this year with new proprietary sequencing chemistry developed after U.S. District Court Judge William Alsup in San Francisco issued a preliminary injunction in September forcing the company to halt sales of the instrument in the U.S., in a patent dispute with Illumina over the original chemistry. “We are very pleased to work with Bristol-Myers Squibb to potentially create what could be the first-ever NGS-based companion or complementary diagnostic to provide key insights for personalized decision-making in the rapidly expanding area of immuno-oncology,” Qiagen CEO Peer M. Schatz said Saturday in a statement. BMS says its clinical development program has 14 clinical-stage molecules designed to target different immune system pathways, and is studying broad patient populations across more than 50 types of cancers.